RAYMOND FEDERMAN was a French–American novelist and academic, known also for his poetry, essays, translations, and criticism. He held positions at the University at Buffalo from 1973 to 1999, when he was appointed Distinguished Emeritus Professor. Born in France in 1928, Federman taught for more than three decades in the English and Comparative Literature departments at the University at Buffalo (1973-1999). Most well-known for his scholarship on Samuel Beckett, he published ten novels, five volumes of poetry, and numerous articles and essays, and his work has been translated into 15 languages, including Hebrew and Japanese. “Though he was often described as a writer of postmodern fiction, Mr. Federman preferred to call what he did “surfiction,” a term he coined in the 1970s to describe the murky borderland between fiction and nonfiction. Shunning most conventional storytelling techniques, his novels often employ multilayered narratives, shifting perspectives, knowing asides and leavening doses of humor. 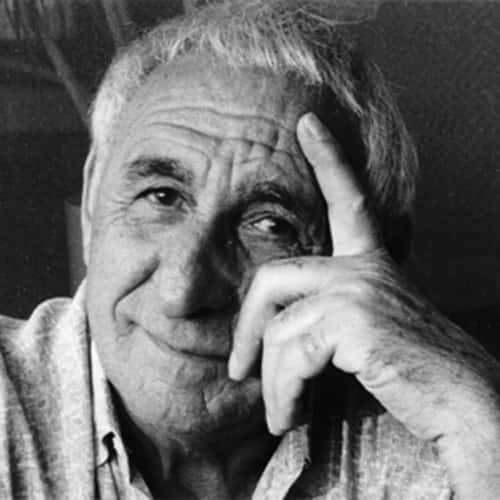 Among his other novels are “Take It or Leave It: An Exaggerated Second-Hand Tale to Be Read Aloud Either Standing or Sitting” (Fiction Collective, 1976); “The Twofold Vibration” (Indiana University, 1982); and “Smiles on Washington Square: A Love Story of Sorts” (Thunder’s Mouth, 1985), which received an American Book Award in 1986. 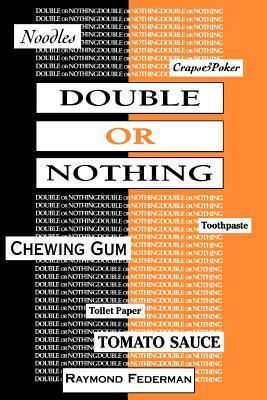 Double or Nothing is a concrete novel in which the words become physical materials on the page. Federman gives each of these pages a shape or structure, most often a diagram or picture. The words move, cluster, jostle, and collide in a tour de force full of puns, parodies, and imitations. Within these startling and playful structures Federman develops two characters and two narratives. These stories are simultaneous and not chronological. The first deals with the narrator and his effort to make the book itself; the second, the story the narrator intends to tell, presents a young man’s arrival in America. The narrator obsesses over making his narrative to the point of not making it. All of his choices for the story are made and remade. He tallies his accounts and checks his provisions. His questioning and indecision force the reader into another radical sense of the novel. The young man, whose story is to be told, also emerges from his obsessions. Madly transfixing details noodles, toilet paper, toothpaste, a first subway ride, a sock full of dollars become milestones in a discovery of America. These details, combined with Federman’s feel for the desperation of his characters, create a book that is simultaneously hilarious and frightening. The concrete play of its language, its use of found materials, give the viewer/reader a sense of constant and strange discovery. To turn these pages is to turn the corners of a world of words as full as any novel of literary discourse ever presented. Double or Nothing challenges the way we read fiction and the way we see words, and in the process, gives us back more of our own world and our real dilemmas than we are used to getting. Browse through highlights of noteworthy literary events that Just Buffalo has brought to Western New York, featuring some of the world’s greatest literary talent. Learn about the individuals whose passion, dedication and commitment make this organization strong. Just Buffalo’s work would not be possible without the dedication of our committed volunteer board. Take a look at our archive of newsletters and annual reports.